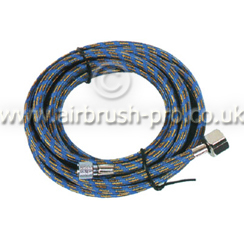 Air hose 1.8 metre length, external 7.5mm x 4.5mm internal. Adaptor 1/8bsp both ends. This air hose will fit our compressors AS06, AS18-2, AS18-A, AS18C, AS-186, AS186A & AS196 and all our BD range of airbrushes. 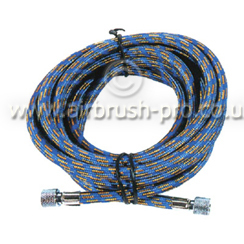 Air hose 3 metre length, external 7.5mm x 4.5mm internal. Adaptor 1/8bsp both ends. This air hose will fit our compressors AS06, AS18-2, AS18-A, AS18C, AS-186, AS186A & AS196 and all our BD range of airbrushes. Air hose 1.8 metre length, external 7.5mm x 4.5mm internal. Adaptor G 1/8" - G 1/4" this will fit compressors with G 1/4" Male.